Dairy. It’s an ongoing love/hate relationship for me. Being moderately lactose intolerant, I’ve always struggled to enjoy dairy freely whenever I want. I’m likely luckier than some, where I can have limited amounts dairy and not be affected but where I am able, I would prefer a lactose free option. Though I’m glad to see many coffee shops and cafes have lactose free options now, I do still come across a few spots in the city that don’t. When Natrel announced the launch of their new line of lactose free products in a single-serve format, I was giddy with joy. I no longer need to lug over my own carton of milk to a friend’s to enjoy my cup of après dinner coffee. I can now enjoy all the fresh taste of milk, without the discomfort. 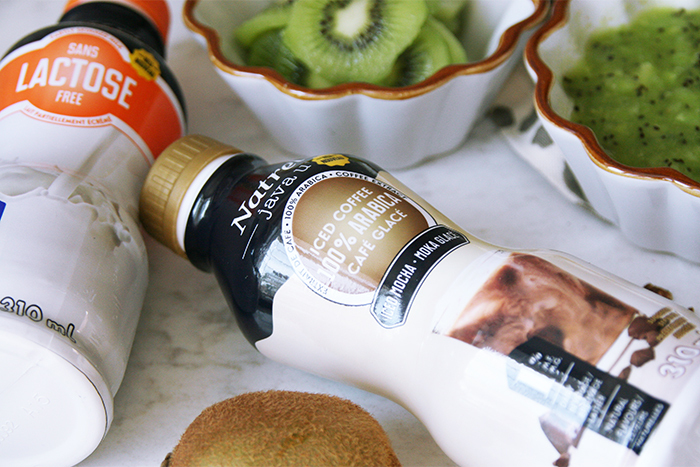 See what recipe Natrel’s new launch inspired me to make! 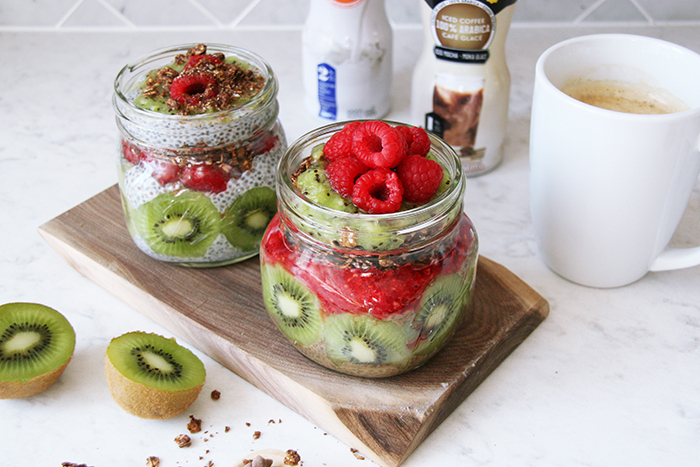 I love preparing my breakfast in jars. They are perfect to make ahead of time and also fantastic to take into the office. There are countless options when it comes to ‘breakfast jars’, and if you do a quick search on Pinterest or Instagram, you’ll also learn that some of these jars look like a work of art! 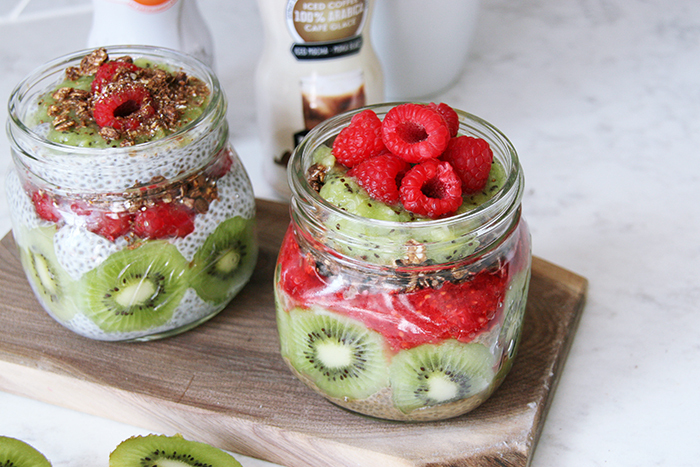 The new Natrel to-go format inspired me to create these raspberry and kiwi chia pudding breakfast jars. I made two flavours, one with the lactose free 2% M.F. milk for me and because Kyle loves coffee and is not lactose intolerant, I used the new 1% M.F. Iced Mocha Coffee flavor for him (contains 100% Arabica coffee extract and milk from Canadian dairy farms created in collaboration with java u). Natrel also released two additional flavours, lactose free 1% M.F. chocolate milk and a 1% M.F. 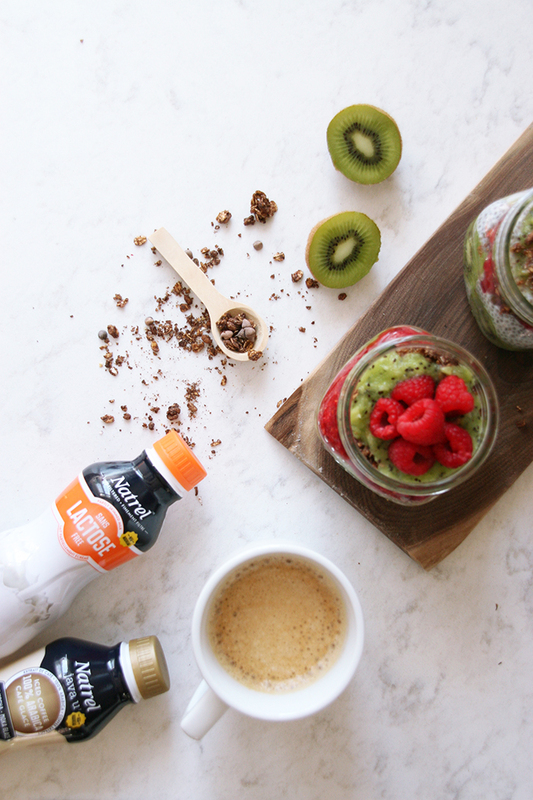 Iced Latte Coffee flavour, giving you addition options for more on-the-go recipes! 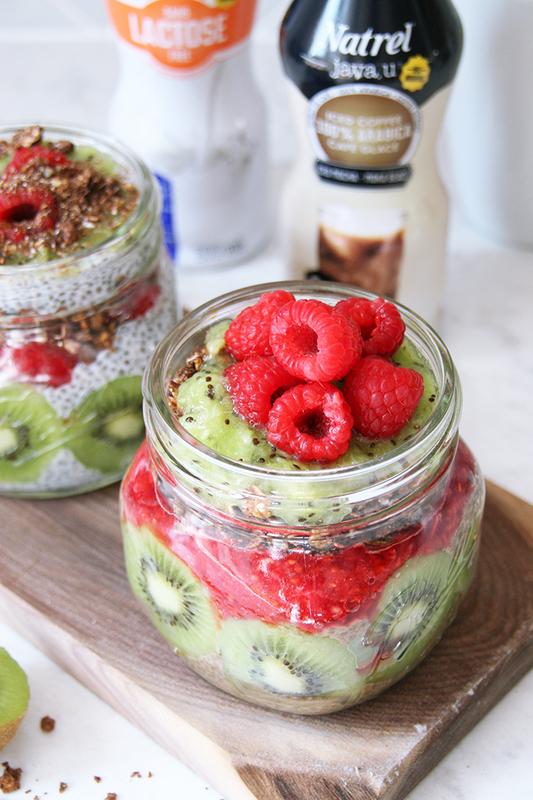 In terms of assembling your breakfast jars, alternate layers of chia pudding, granola, sliced/whole fruits, and fruit puree as you desire. I lined the edge of the mason jars with sliced kiwis for an added artistic flare! 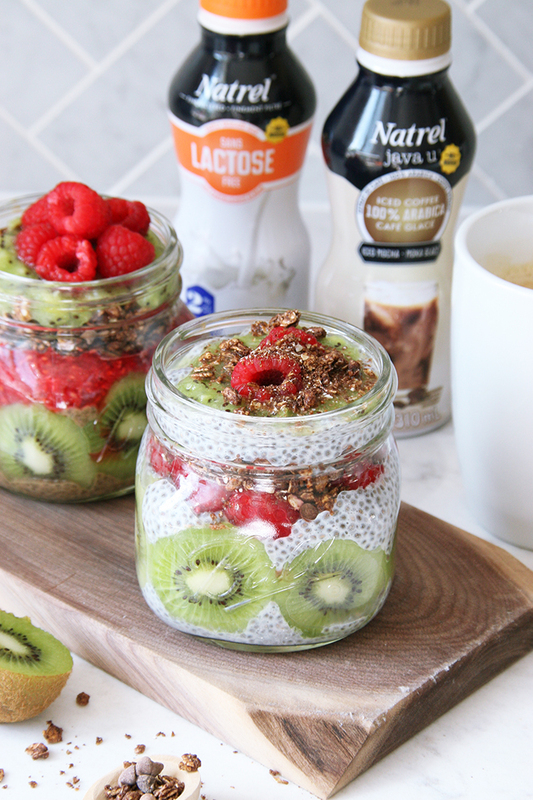 These chia pudding jars are so delicious and using mason jars allows you to store them in the fridge for up to three days! They are the perfect companion in the morning or as an afternoon snack. Hope you’ll give these a try! 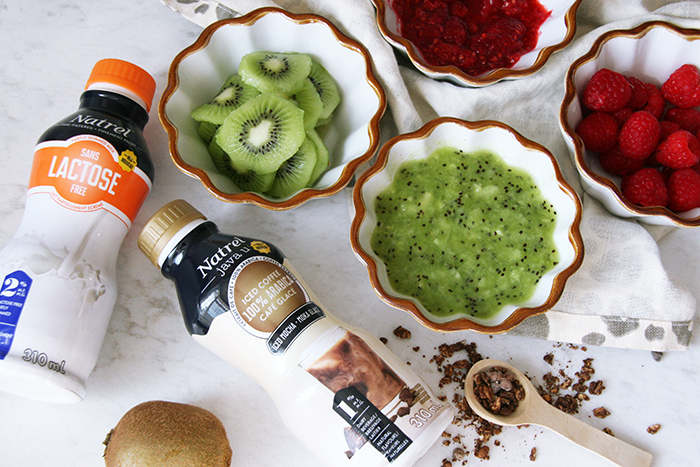 This post was created in partnership with Natrel, however recipe idea and views are my own.